Henry Tash was `Boots' here in September 1873. A bill heading from 1862. Known as the RAMPING HORSE INN from 13thC to 16thC. Disorderly conduct by Irish troops, billeted at the house by King Charles I (Born 1600 - executed 1649) is said to have swayed local opinion to the Parliamentary Cause. N.B. Neat Wines, Arrack, Rum, Brandy, &c. and London Porter. On 3rd April 1777 William Cobb, late of the Rampant Horse, announced that he had taken the NAGS HEAD , St Stephen. It appears that his intention in April 1776 to go to the Bull at Brandon was short lived. Offered To Let 22nd August 1778, with stables for about one hundred horses. Apply to Mr. Henry Green on the premises or to Charles Weston Esq. Immediate occupation and furniture to be taken at a fair value. The first coach service to Ipswich departed from here in 1782. One of 36 Norwich houses opened for the reception of Voters in the interest of Mr. Windham and Mr. Coke on election day Thursday 13th November 1806. The name of the Hundred for which the house was appropriated was to be displayed at each house. William Eke advised the public April 13th 1811 that he had resigned from the Inn in favour of Isaac Johnson. Mr. Johnson assured Commercial Gentlemen that they could depend upon the strictest attention being paid to them. Mr. W. Leach announced 20th July 1822 that he had just completed alterations and improvements to the house and it was fitted up for the reception of the Nobility, Gentry, Commercial Gentlemen and the Public in General. William Leach announced Saturday 21st June 1828 that negotiations he had lately been engaged in, for transfer of the Inn, had broken off and he would thus continue with the Business. 13th June 1829, Christopher Twiss gave Gratitude for the favours of the Nobility, Commercial Gentlemen and the Public in general, for the support he had received since taking the Inn. He added that there was a vacancy for a First Rate Cook. In 1830 the coach the Telegraph left for London every day at 7:00am. The Magnet left daily at 4:30 also London bound. The Comet headed off for Great Yarmouth daily at 8:00am via Loddon, Haddiscoe and Southtown. For Sale by Auction Wednesday 6th September 1843. With most elegant modern front recently erected in the most substantial manner. Containing 12 dining and sitting rooms, 34 sleeping rooms, making up 40 beds, admirably arranged bar, spacious kitchen, splendid vaults, offices and water closets. The Yard containing 4 stables, coach house booking office and hostelry. In occupation of Mr. Twiss who has carried on at the Establishment for 15 years. 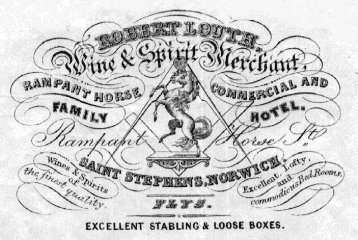 Robert Louth announced 29th August 1857 that he had also become the proprietor of the NEW REFRESHMENT ROOMS, Thorpe Station. A group of cases awaiting despatch in the 1800's were found to contain corpses stolen by grave robbers from Lakenham churchyard. and in 1879 as the RAMPANT HORSE STORES at Red Lion Street. Licence refused 22.11.1892 on account of the bad character of the house.